Well, of course, as a native Hebrew speaker I can read all of these fluently and eloquently. They all say...um...well.. it's hard to translate into English. Shavua tov le'cooolam'. 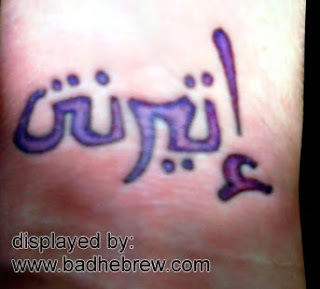 The Arabic one actually reads "IBIRNI"
The arabic tattoo is the transliteration for eternity. Ee teer nit ee. Of course, it has no meaning in Arabic, so congrats on the fail. the arabic one is eternity, as the anonymous above me said. I must be missing something, but how do you know these people think their tattoos are Hebrew? How do I know? 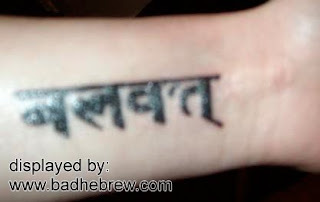 Well, I've taken those tattoos from sites where either the owner or the tattoo artist claimed them as Hebrew. The Sanskrit (Hindi?) one indeed seems to say something involving 'strength': balavat, or -ant (I'm not sure what to make of the small curved stroke to the left of the t). Thanks for the info! Tibetan, eh? 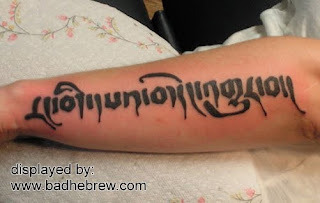 It's interesting how some of those Tibetan letters could pass for stylized Hebrew. Very cool. >How do I know? Well, I've taken those tattoos from sites where either the owner or the tattoo artist claimed them as Hebrew. You're welcome! Unfortunately I can't read any Tibetan, so I wouldn't know what it says. Nor does the owner, apparently. Pretty as the script may be, it amazes me how people decide to have texts permanently inscribed in their bodies without knowing what language it is. And yes: the Arabic one says 'Eternity' in phonetic English. The Arabic looks like a bad "uh-teer-nt-A"
The devanagari script is likely Sanskrit, since they wouldn't bother with the virama at the end in Hindi. As such, I'd transliterate it as "balavat", whatever that might be. The Sanskrit word is the adjective "strong" in the neuter gender. So I think the tattoo owner meant to say he's a strong neuter. The Arabic one definitely reads as "eternity" in transliteration. The actual arabic word for "eternity" is دهر "dahr"